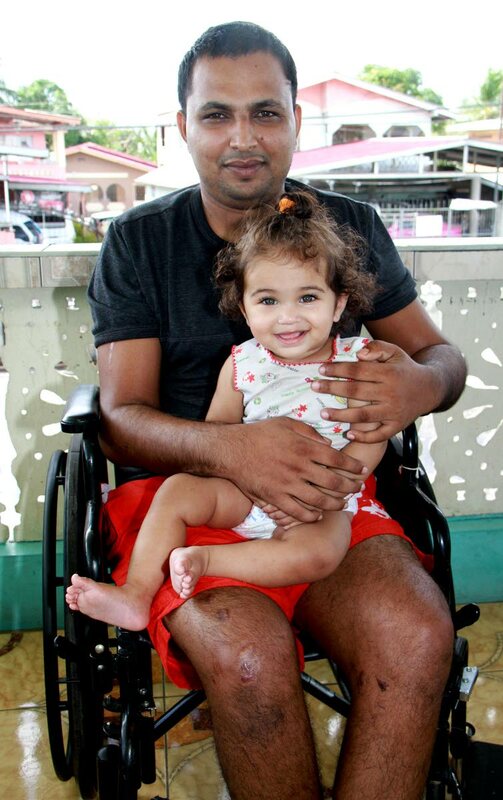 SEEKING JUSTICE: Shameer Boban with his daugher Karen, eight months, at their Barrackpore home yesterday. THREE months after an accident claimed the life of his wife Shamilla Singh, 36, Barrackpore widower Shameer Hosein Boban, 28, who survived that accident, is still seeking justice for her. “The investigating officers are doing absolutely nothing in this case,” Boban said yesterday. Singh died on the spot when a car travelling in the opposite direction along GP Road in Barrackpore, swerved off and slammed into Boban’s car. Their eight-month-old daughter Karen Hosein Boban, who was also in the vehicle, survived and has since been in the care of Boban’s mother Jaitoon Boban, 57. Confined to a wheelchair, Boban spoke of how he still weeps for his wife almost daily. Singh was a geriatric nurse at the Eric Williams Medical Sciences Complex. “In one instant, my life changed all because of a drunk teenaged driver, who up to today, is not paying the price for what he did,” Boban sobbed. He spent several days at the Intensive Care Unit at San Fernando General Hospital having suffered a broken hip, broken legs, arm and ankles in the accident. His body is riddled with scars. At 5 pm on November 28, Boban was driving his Nissan Sunny east along GP Road. His wife was sitting in the back with their baby, who was in an infant car seat. Police said that near Mussarapp Trace, a white Nissan Tiida heading in the opposite direction slammed head-on into Boban’s car. On impact, the two male occupants of the Tiida, both 19, were thrown out and landed in nearby bushes, but escaped serious injuries. Boban said that he is in possession of videos which he says shows the teen driver performing stunts on the same road. He believes the police have “closed” his case because since the incident, the investigating officers from Barrackpore Police station have not given any information on the matter. He added that this is a case of motor manslaughter. Reply to "No justice for my dead wife"